Uses real cases to illustrate diagnostic decision-making, nonsurgical and surgical management and care, and outcomes measurement for a variety of complex distal radius fractures, as well as 44 videos—over two hours—of procedures all on the DVD and website. Includes the fully-searchable text online for quick and easy access to the information you need. 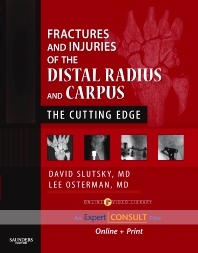 Covers distal radius fractures from imaging and classification to the new locking plate designs, emerging nonplate alternatives such as intramedullary and T-pin fixation, and newer nonbridging external fixators for intra-articular fractures to provide you with the latest developments in the field. Presents material in a concise, practical format for an ideal review before surgery. Provides a visual display of intraoperative procedures through full-color images and photographs. Features additional chapters—Role of Advanced Imaging in Distal Radius Fractures, Patient-focused Wrist Outcome Instrument, Biomechanics and Biology of Plate Fixation of Distal Radius Fractures, Micronail, Rehabilitation Following Distal Radius Fractures: a biomechanical/procedure specific approach, Use of Thermal Shrinkage – Biology and applications, Arthroscopic Thermal Shrinkage for Scapholunate Ligament Injuries, Rehabilitation following Carpal Injury, Reconstruction of the Distal Radius Facet by a Free Vascularized Ostechondral Graft—online for even more value. 1. History of Treatment of Distal Radius Fractures, Jeffrey Yao M.D. 2. Role of Casting of Distal Radius Fractures, Joseph Dias M.D. 3. Use Of Standard X-rays And Classification Systems In Guiding Treatment, Robert J. Medoff M.D. DVD - 1. Role of Advanced Imaging in Distal Radius Fractures, William Morrison M.D. 4. Distal Radius Fracture Database/ Design rationale for locking plates, Matthew Putnam M.D. DVD - 3. Biomechanics and Biology of Plate Fixation of Distal Radius Fractures, Allan E. Freeland M.D. 10. Dorsal Plate Fixation. Ronaldo S.Carneiro M.D. 15. Pediatric Distal Radius Fractures, Scott H. Kozin M.D. 16. Anatomy of the Radius and pitfalls with Locking Plate Fixation, David Nelson M.D. 19. Principles and Application of Internal Bridge Plate, Douglas Hanel, M.D. 23. Use Of Bone Graft Substitutes in Distal Radius Fractures, Brian J. Hartigan M.D., Richard Makowiec M.D. 25. TFCC Anatomy and DRUJ stability, William B. Kleinman M.D. 27. Anatomy and Biomechanics of Forearm rotation, Michael Sauerbier M.D., PhD, Frank Unglaub, M.D. 28. Ulnar Head and styloid fractures, Doug Campbell M.D. 31. Essex-Lopresti Fractures, Matthew M. Tomaino M.D. 35. Hemi-resection Interposition Arthroplasty, David S. Zelouf M.D. 37. Ulnar Head Implants: Constrained, Luis Scheker M.D. 39. Kinematics of the Scapholunate joint, John K. Stanley M.D. 40. Kinematics of the Lunotriquetral Joint, Marco Ritt, M.D. 45. Arthroscopic diagnosis of carpal ligament injuries with Distal Radius Fractures, Tommy Lindau M.D. DVD - 6. Use of Thermal Shrinkage - Biology and applications, Daniel J. Nagle M.D. 47. Reduction Association of the Scaphoid and Lunate (RASL), Melvin P. Rossenwasser M.D. DVD - 7. Arthroscopic thermal Shrinkage for scapholunate Ligament Injuries, Ferdinando Battistella M.D. 54. Treatment of Non Unions of Distal Radius Fractures, David C. Ring M.D. 55. Radioscapholunate arthrodesis for post traumatic OA, William H. Seitz Jr., M.D. 56. Osteotomy for Extra-articular malunion of the distal radius, Diego L. Fernandez M.D.